The burger: Wednesday is now my favorite day of the week. That’s when Erik Sather and his crew feature a life-affirming cheeseburger on their menu at Lowry Hill Meats. It makes perfect sense that a butcher shop would have the goods to back up a burger of merit, and now I’m wondering why more don’t get into the act. This beauty of a burger is rooted in the weekly arrival of a steer from a Blooming Prairie, Minn., purveyor, a pasture-raised animal that’s finished on non-GMO grains. Here's another distinction: the shop’s ultra-fresh ground beef is composed of the accumulation of trimmings solely from that single animal, a formula that results in unusually consistent texture and flavor qualities. No wonder that this is one notably tender and juicy patty. It’s a quarter-pounder, which for Sather is an easy-to-handle quantity. It’s cooked to a straight-up medium, and each bite fairly bursts with juices. Which leads me to the placement of the lettuce. Those fresh green leaves are not sitting under the patty by accident; that's strictly an engineering feat. Did I mention that our order arrived in just under the seven-minute mark? That’s not quite fast food, but it’s pretty darned close. The tomato brimmed with just-right color and juice attributes. The pickles? Also fantastic. So crunchy, with such a sharp, palate-cleansing bite. They’re the work of staffer Michelle Jensen. As for the cheese, it’s a house-made American, and there’s plenty of it, thank goodness. Attention must be paid to the bun. Dear lord, that bun. It hails from the Salty Tart. Sather renders the leaf lard from the shop’s Berkshire or Red Waddle hogs, then passes it off to baker Michelle Gayer, who, not for nothing, has a handful of James Beard Foundation award nominations to her credit. Gayer switches out some of the butter in her brioche recipe for that silky lard, and, trust me, magic happens. It also explains the “pork fat bun” name. They’re given a brush of butter and toasted, and the warmth from the flattop unlocks even more delicate softness. Even that deeply golden color fairly epitomizes "mouth-watering.” You can’t imagine how delicious they are, truly. Yep, Sather has struck upon the formula for uncomplicated cheeseburger fabulousness. Agreed. Its only downside? The once-a-week thing, a schedule that, unfortunately, isn't going to open up anytime soon. Price: $9. A considerable bargain, given the quality on display. They’re available all day. Or until supplies last. 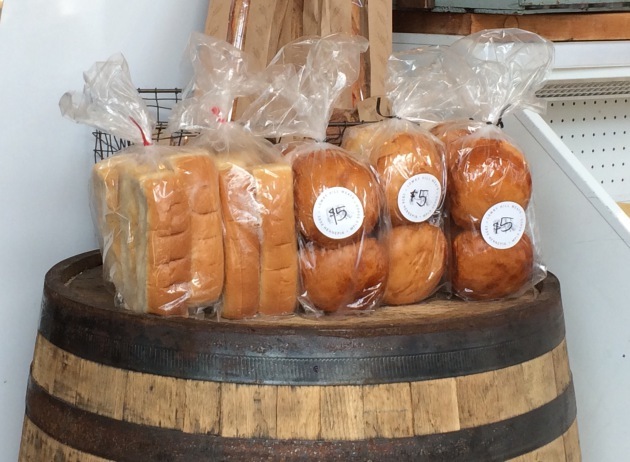 “As long as we have Salty Tart buns, we’ll make burgers,” said Sather. Fries: None. Instead, carb-load on the over-the-top cheddar crackers imported from Collective Goods in Madison, Wis. (Sather’s business partners), sold at the counter. In other sandwich news, it should be noted that Monday is meatloaf sandwich day at the House of Sather, and weekend mornings are all about ham-and-egg sandwiches on English muffins. Thank goodness the fantastic buttered radish sandwich is available daily. Try this at home: The shop’s extraordinary ground beef retails for $7 per pound; for the same price, Sather even helpfully divvies it into 1/4-pound patties for lazy cooks like yours truly. Since it’s prime Weber/Char-Griller/Big Green Egg season, I asked Sather if he had any recommendations for those who prefer to grill their cheeseburgers, rather than use a flattop. Park it: Yes, parking can be tight in this neighborhood, particularly since Hennepin Avenue is in the throes of a massive reconstruction project. But fear not: the ever-accommodating shop has a handful of parking spots in a small lot behind nearby Lowry Hill Liquors; enter on Colfax Avenue. Address book: 1934 Hennepin Av. S., Mpls., 612-999-4200. Open 10 a.m. to 8 p.m. weekdays, 9 a.m. to 6 p.m. weekends.